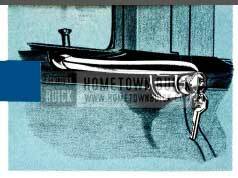 Identical keys operate all the locks on your Buick. Remove the “Knock-out” number and keep it in a safe place, to be used if your keys are lost or mislaid and duplicates are required. To lock the ignition, turn the key to “lock” to shut off the ignition but still leave it operative with the key removed, turn the key to “off.” The car may then be operated yet the privacy of the glove and trunk compartments retained. Lock the ignition and the doors of your car when leaving it unattended. Over 75% of the vehicles stolen have been left either with the key in the ignition lock or unlocked. CAUTION: It is possible to damage certain parts of the radio if the starter is engaged while the radio is on. As an added pre­ caution, do not attempt to start the engine unless the radio is off. The radio switch may be turned on after the engine is running. For driving speeds up to 50 miles per hour no special break-in precautions are necessary. Driving speeds above 50 miles per hour should be avoided for the first 500 miles, and any sustained speeds above 50 miles per hour should be avoided until the car has been driven 1,000 miles, although speeds up to 70 miles per hour may be used for short distances if desired. Warming the engine at low speeds allows all parts to expand more uniformly to operating clearances. Headlights, parking lights, ignition key light, instrument lights, and map lights are controlled from a single four-way switch marked “LIGHTS” located at the left of the instrument panel. There are two “out” positions in the switch obtained by pulling the knob. The first step turns on the parking lights, tail lights, and ignition key light, and the second step controls the headlights with the tail lights and ignition key light remaining on. Instrument lights and map lights may be turned on in either step by simply turning the knob. In the extreme left position, both instrument and map lights are “off.” By turning the knob to the right one step the map lights are “on.” The next step to the right illuminates the instrument panel . Continued turning to the right diminishes the intensity of the instrument panel lights. All lights may be turned “off” by simply pushing the control knob all the way in. It is not necessary to turn the knob in either direction before pushing in the knob. When pulled out again, instrument or map lights will be illuminated as previously. The lower and upper beams of the headlights are controlled for city and country driving by a foot-operated switch located on the car floor adjacent to the position of the left foot. When the upper beam is in use, a small red light is illuminated on the speedometer just to the right of the trip mileage on Series 50-70 cars and in the center of the turn indicator emblem between the two instrument clusters on Series 40-60 and M-100 cars. Vacuum-operated wipers are used for cleaning a large vision area on wind­ shield glasses. Adjustable speed control is had by turning a knob located on lower edge of instrument panel at left of steering column. SELECTION – In the selection of the proper brand of oil it is essential to consider the reputation of the refiner or marketer. There are several types of oil manufactured for use in internal combustion engines. For use in the Buick engine we recommend that an oil marked “For Service MS” (formerly called heavy duty) be used for maximum protection under all driving conditions. If Service MS oils are not available those marked “For Service MM” (formerly called premium oils) may be used. Oils marked “For Service ML” (formerly called regular oil) are not recommended in any Buick engine. The oil gauge rod is marked to indicate how much oil must be added to maintain proper level. The space between the “ADD” line and “FULL” line represents two quarts. The oil level should be maintained as close as possible to the “FULL” line. When checking the oil, allow the car to stand with engine off for two to five minutes so that oil the upper engine may return to the oil pan thus providing an accurate check. DO NOT OVER­ FILL. It is imperative that the same brand of oil be used at all times. For proper S.A.E. grade of oil see Page 23. On the lower roll of the instrument panel just to the right of the ignition switch are three knobs which control the heating, defrosting and ventilation of the car. The left knob serves a dual purpose by controlling the temperature setting of the temperature control valve (thermostat) when moved upward from the center position and opens the left ventilator valve to admit outside air, when moved downward from the center position. just above this knob is a three-position (off-low-high) toggle switch which controls the speed of the undersea! heater blower. The center knob controls the amount of defroster air Flowing to the windshield. In the center position, the defroster air is “off,” but as the knob is moved upward, an increasing amount of air Flows to the windshield. The knob does not move below the center position. The knob on the right also serves a dual purpose by directing air either through the auxiliary heater or through the right ventilator valve to Floor of car. Moved upward from the center position, air is directed through the auxiliary heater. Temperature for this heater is controlled by the upward movement o f the left knob simultaneously with the defroster and undersea! heater. When the right knob is moved downward from the center position, out­ side air is directed through the right ventilator valve. All the way down the air is directed straight out and as the knob is moved towards the center position, air is directed to the Floor of the car. The switch above the right knob is an off-on switch which operates the auxiliary heater blower. Generally speaking the “down” position of the knobs is intended for summer operation and the “up” positions provide for winter heating and defrosting. For maximum efficiency of the system, leave one or two ventipanes opened slightly to exhaust old air and permit free circulation of new air. NOTE: To keep out offensive traffic odors and exhaust gases when traveling in congested traffic or when parked behind a car having its motor running, close all outside air intakes including defroster and auxiliary heater. Exhaust gases contain carbon monoxide. See note inside back cover. Control of the Twin Turbine Dynaflow Drive is obtained by positioning the control lever mounted directly below the steering wheel. Twin Turbine Dynaflow cars do not have a clutch pedal and lever may be placed in any position when engine is idling by merely moving the lever. Stops have been placed at certain points in the lever travel so that it is necessary to raise the lever to place it in certain positions. 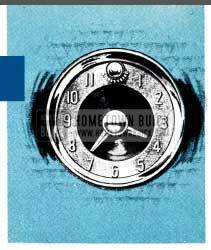 After a little experience driving the car, 1954 Buick Owners will find that it is possible to select a range merely by “feel” and visual reference to the dial will not be necessary. However, the dial is illuminated for night driving and is controlled by the instrument panel lighting circuit . NOTE: The starting motor circuit on cars equipped with the Dynaflow Drive is so wired that the engine will not start unless the control lever is in either “P” or “N” positions. This is neutral and is to be used when towing the car and may be used instead of “P” when car is standing still and engine is running. Control lever must be raised when moving it from “D” to “N” position. This range is used for all normal for ward driving. After engine has been started, place control lever in “D” position and de­ press accelerator pedal . Nothing more need be done. This range is to be used when the “going” is particularly tough, such as deep snow, or sand, or on long steep grades. To operate in this range, simply move the control lever to “L” position and drive as before. This range may also be used for “braking” the car speed on long or steep down grades. The shift from “L” to “D” or vice versa may be made while the car is in forward motion by merely Ripping the l ever. These shifts should no t be made at speeds over 40 M.P.H. This position reverses the car motion. To operate with car standing, raise and move control lever to stop at bottom of lever travel . Depress accelerator pedal for backing car. Pushing or Towing Car to Start Engine – If it becomes necessary to push a Dynaflow Drive car to start the engine, place shift control lever in Neutral (N) until car speed reaches approximately 15 MPH, then shift into Low (L). Continue to increase car speed until engine cranks (approx. 25 MPH). 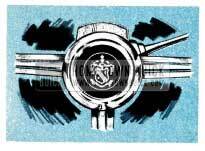 After engine starts, return control lever to Neutral (N) for engine warm up. It is safer to push car than tow it. 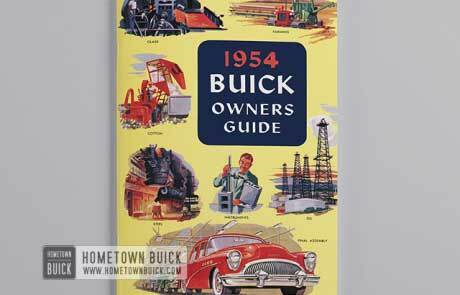 As in your selection of motor oil, consider the refinery or marketer in choosing the gasoline for your Buick. Most gasolines will perform satisfactorily but in some cases such as high temperatures or carbon accumulations, a premium gasoline will produce less detonation or “spark rap.” Normal detonation or “spark rap” is not harmful. 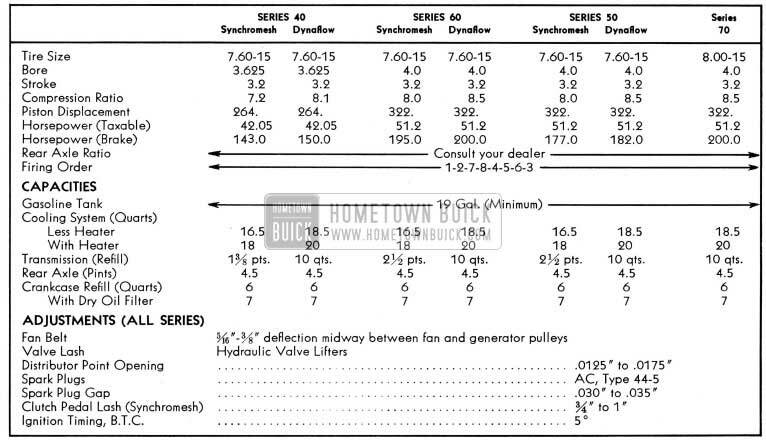 Series 40 Buicks equipped with Synchro-Mesh transmission may use REGULAR fuel, while compression ratios in Series 40 cars equipped with Dynaflow Drive and in Series 50, 60, and 70 cars are sufficiently high to fully utilize PREMIUM fuels, and the most satisfactory performance will be obtained through their use. Washer is operated by pressing and holding, for a few seconds, the small button on the center of the windshield wiper knob on Series 50 and 70 cars, and by pressing the wiper knob on Series 40-60 cars. Release button, start wiper arms by turning control knob to “ON. ” Washer will operate for several seconds before shutting off automatically. Keep the glass jar Riled with water. 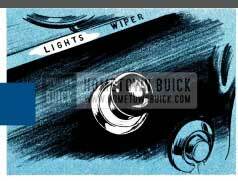 In freezing weather use Buick windshield washer solvent part No. 980807. Do not use water containing alcohol or other anti-freeze as it will damage car finish. 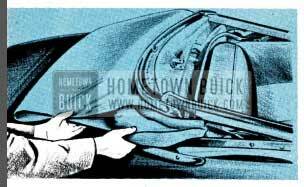 Should 1954 Buick Owners contemplate hauling a house trailer with their Buick, it is advisable that 1954 Buick Owners follow our instructions covering weight limits,. springs, tires, and hitch specifications. 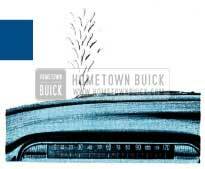 To obtain this information, write Buick Motor Division, Service Department, Flint, Mich. The front seat on all Buick models is easily adjusted to any position for­ ward or backward to provide maxi- mum driving comfort. Manually-operated seats may be adjusted by merely pressing the control lever at the driver’s end of the seat and exerting slight body pressure either forward or backward. When in the desired position, the seat adjuster mechanism will automatically lock to prevent movement. Forward or backward movement of power-operated seats is con­ trolled by a button on the driver’s end of the seat which is pressed in the direction of desired travel. The seat is automatically locked when the control button is released. Easier rear seat entrance can be made on all two-door models due to the angular tilting split seat backs. The Series 50-70 and M-100 two-door models have, in addition, a sliding seat arrangement on the passenger side. As the seat back is tilted forward, a mechanism unlocks and allows the seat cushion to slide forward automatically. When the seat back is returned to its normal position, the mechanism will lock the seat in its original position. This is a mechanically operated brake which locks both rear wheels. This brake is operated with the foot and is located on the left side under the instrument panel. This brake is self-locking and will remain applied until the knob marked “Brake,” located at lower left Flange of instrument panel, is pulled out to release. This brake should always be released before the car is driven. To provide full power for the brake system with the ignition switch “ON,” a booster pump mounted on rear side of left front fender skirt operates as follows: When the ignition switch is turned on, the pump automatically starts and continues to operate until the genera­ tor delivers a pre-set amperage which is below normal low idle. This takes one or two seconds. Should the engine stall while driving, the pump automatically starts and continues to run until the generator is again producing the required amperage to shut it off. When the pump is not operating, the engine provides the power for the brake system. The ignition switch must be “ON” to provide full braking power if the engine is not running. With the ignition switch “OFF,” the brake system may be operated like any mechanical brakes but requires added effort on the part of the driver. (1) Set parking brake, remove hub cap, and loosen wheel bolts. (2) Place jack under bumper face plate and raise until tire clears ground. In replacing either front or rear wheels, tighten wheel bolts snugly, lower jack until wheel touches ground, then MAKE CERTAIN THAT ALL BOLTS ARE DRAWN UP TIGHT. Bolts must be tightened in criss-cross sequence to prevent wheel run-out. (1) Set parking brake and remove hub cap with sharp end of jack har.dle. (2) Slightly loosen all wheel bolts. (3) Place jack under front bumper just outside of bumper bomb and raise jack until tire clears ground. INSTRUCTIONS TO OPERATE DOUBLE ACTION “V” SECTION CAR JACK. TO RAISE CAR-With trip lever on side of housing in a horizontal position, and a firm grip on the jack handle, press down or lift up slowly the full travel of the handle. As the ratchet or pawl releases from the rack bar, a distinct click can be heard. Continue the up and down movement of jack handle until car is raised to height desired. TO LOWER CAR-The trip lever should be in the down or vertical position. To lower the car, operate the jack handle the same as for raising the car. 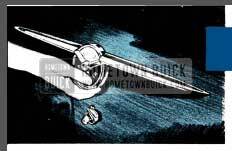 With the trip lever in the horizontal position, the jack will raise the car with a downward movement of jack handle. There is no load on the jack handle during the upward movement of handle. 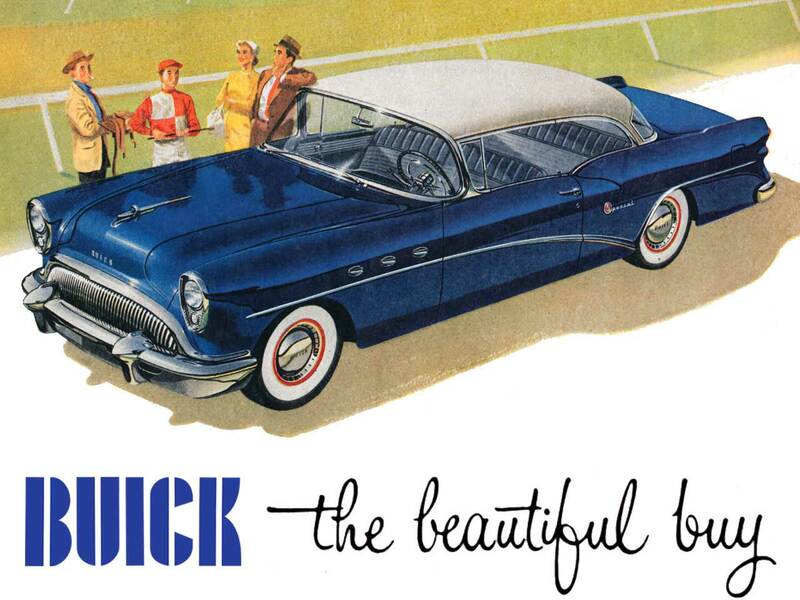 The Buick hood is a conventional front-opening, spring counterbalanced hood of the so-called “alligator” type. The hood latch is controlled from the front of the car by a pull lever located between the radiator grille and the radiator grille header bar. To open the hood, locate the pull lever by placing the fingers under the header bar, slightly to right of center. Pull firmly and the hood latch will release the hood.lt may then be raised completely. To close the hood, lower it to a near-closed position, then push firmly down­ ward until the latch is fully engaged and the hood cannot be raised even slightly. If not properly locked, the hood will remain partly opened held only by the safety latch. To operate the turn signals, the ignition switch must first be turned on. 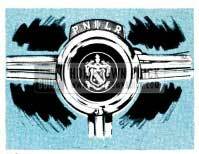 The switch lever on the left of the steering column should then be pushed up for a right turn and down for a left turn. This action causes the front lamp and the lower of the two lamps mounted at the extremity of the rear fender to flash on that side of the car in which direction the turn is to be made. Verification of the proper functioning of both front and rear lamps is indicated by a flashing of one of the illuminated green arrows, located at the ends of the speedometer on Series 50 and 70 cars and to the right or left of the light indicator emblem, located between the two instruments on Series 40-60 and M-100 cars. If the arrow does not light and flash, after movement of the turn signal lever, it indicates that the signal system is not functioning properly and should be checked for burned out bulbs in either front or rear signal lamps or the bulb which illuminates the green arrows. Always INDICATE a turn at a reasonable distance before making the turn. The compartment lid lock is located directly below the rear compartment ornament. Insert and turn the key and raise the compartment l id, using lower edge of ornament as a handle. To lock, firmly close lid. 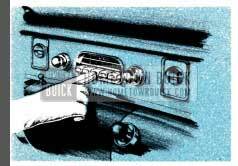 Switch and Volume Control (Left Knob)-The first portion of rotation in a clockwise direction turns on the radio. Further rotation increases volume. Tone Control (Chrome Plated Lever Behind the Volume Control Knob)-Control in extreme “treble” position gives brilliant reproduction of the full tone range. This position will reproduce speech very clearly and distinctly. Rotation counterclockwise (toward “bass”) diminishes brilliance and accentuates low notes. Tuning Control (Right Knob) -When tuning manually, or when setting up a station on one of the buttons, remember-If the pro­ gram sounds shrill or distorted, it is probably caused by improper tuning and can be corrected by adjusting the tuning knob slightly. Since the low notes are more affected by tuning than the high tones, it is a good plan to tune the set to a point where the low notes are heard best and the high notes are clear but not shrill. Setting the push buttons to tune to any desired station is a simple procedure requiring no tools or equipment. Press button to left and at the same time pull it out as far as possible. With button out, tune in the desired station manually. (Do this very carefully as the push buttons will automatically repeat the tuning each time they are pushed. Push button in as far as possible. This automatically completes the button set-up and locks the mechanism in position. 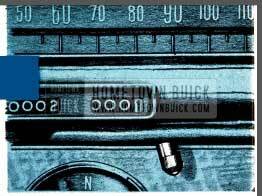 Buick’s Selectronic Radio is an innovation in radio tuning and provides a simple method of station selection regardless of locality. Unlike the Sonomatic Buick Radio which automatically tunes known stations in a particular locality, the Selectronic set automatically and quickly tunes in stations all along the dial which fall within the signal strength set by the operator. Signal strength selectivity may be set at any one of four positions by turning the sensitivity knob located behind the manual tuning knob to either “MORE” or “LESS.” Extreme movement of the knob toward “MORE” will include all available stations. 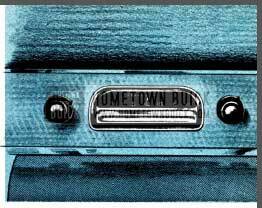 By turning the knob to the extreme “LESS” position, nearly all stations are eliminated except strong local stations. Antenna should be “up” and fully extended. 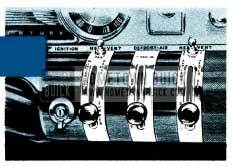 After setting the sensitivity control knob at any one of the four positions, turn on the set and move the dial indicator by either pressing the foot switch or the selector bar on the front of the set. Touch either momentarily and the dial indicator will automatically move to the next station on the dial having sufficient signal strength to fall within the range for which the sensitivity control is set. By repeating this operation intermittently, the dial indicator will “search” the entire width of the dial and automatically return to the low frequency end of the dial ready to “search” the entire dial again. Volume is controlled by the knob at the left end of the dial. 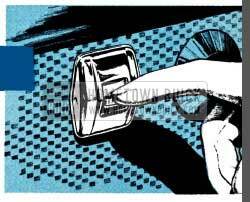 By simply turning the knob clockwise, volume may be increased. Varying degrees of tone between treble and bass are obtained by turning the knob behind the volume control knob as indicated. In some cases, when it is desirable to tune the set manually, simply operate the manual tuning knob at the right of the dial as with any conventional radio. 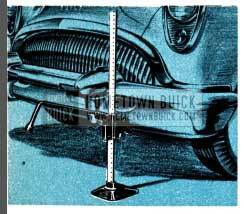 ANTENNA (Both radios) – The Buick radio antenna is located on the left front fender opposite the windshield. The ”manually-operated” antenna must be raised and lowered by hand. 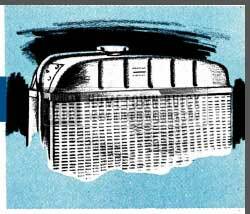 The “electrically operated” antenna (standard equipment on the M-100 and optional equipment on all other models) may be raised or lowered from inside the car even while driving. A toggle switch mounted on the lower edge of the instrument panel to the left of the steering column raises the antenna when pulled toward the driver and lowers the antenna when pushed forward. 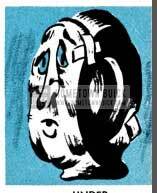 For satisfactory radio operation, the antenna should be fully extended. To reset clock, pull knob “A” at top of clock out and turn in desired direction. To regulate the clock for more accurate timekeeping, place small screwdriver or similar tool in slot in small knob “B” behind the reset knob and turn toward “F” if clock is running slow, or toward “S” if clock is running fast. It is advisable to move the regulator only one division or graduation at a time. By following this procedure your clock may be regulated to keep exceptionally close time. FAILURE OF CLOCK TO RUN-IMPORTANT – The electric clock requires special attention when reconnecting a battery that has been disconnected for any reason, a clock that has been dis­ connected, or when replacing a blown fuse. IT IS VERY IMPOR­ TANT THAT THE INITIAL WIND BE FULLY MADE. (1) Make sure that all other instruments are off. (2) Connect one terminal of the battery first. Before permanently connecting the other cable, touch the terminal to its post on the battery. Immediately afterward strike the terminal again to see if there is a spark. If there is, allow the clock to run down until it stops ticking and repeat as above until there is no spark. Then immediately make the permanent connection before the clock can again run down. The clock will run down in approximately 2 minutes. The above procedure should also be followed when reconnecting the clock after connections have been removed, or when replacing a blown fuse. Be sure to disconnect the battery cable before installing new fuse. Failure of clock to run may be caused by any of the following: Blown fuse-discharged battery-corroded battery terminals wire improperly connected to light switch, fuse block or terminal connection to back of clock-or defective clock. In replacing fuse, use only 2-ampere AGA fuse on all Series. For maximum tire service-keep tires properly inflated – use an accurate gauge-after inflating, be sure valve caps are in place and screwed down Finger-tight. Use air pressure as indicated below for checking proper inflation. 24 Lbs. (starting pressure) AFTER the car has been standing for three hours or driven less than a mile. In temperatures below freezing, inflate 2 lbs. higher. 26 Lbs. (city pressure) AFTER driving the car three miles or more BELOW 40 miles per hour. 28 Lbs. 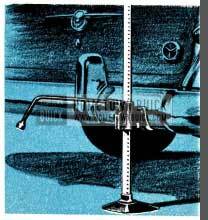 (highway pressure) AFTER driving the car three miles or more ABOVE 40 miles per hour. It is normal for air pressure to build up in a tire due to driving conditions. CHANGE TIRES TO POSITIONS SHOWN IN DIAGRAM AT LEFT AT LEAST EVERY 4000 MILES. This change of position helps out uneven wear on front tires and distributes the faster wear on the rear tires over all five tires. Use soap, warm water, and stiff brush to remove road grime and curb dirt from white sidewall tires. Use medium or fine steel wool for severe cases. Do not use gasoline, kerosene, or any oil product that will discolor the sidewalls and rot the rubber. By comparing air pressure in all tires, any variation in pressures will be evident. To prevent Rat tires, investigate and correct a continued loss of air in any tire. The power operating switch for raising or lowering top is located on lower Range of instrument panel at right of steering column. CAUTION: Before operating power top control button make certain that the top directly above the windshield is raised slightly in order to clear windshield dowels. Close catch. With ignition switch on, pull control knob away from panel and hold until top is completely lowered. After top is lowered, raise it slightly by hand and pull the top material and padding out from under the roof bow so that it lays in position shown. Fold corners of top material as shown in Fig. 3, roll top material up and tuck down into top compartment, fasten hold down strap. Tuck in surplus top material at sides and install top boot. Remove top boot and unfasten hold down strap. Push top control knob forward and hold until top is fully raised. Draw top down over windshield header dowels and fasten catch to lock top. To keep mechanism in good condition the top should be operated at least once a month. CAUTION: DO NOT OPERATE EITHER UP OR DOWN WHILE CAR IS IN MOTION. If top is to be left folded for any length of time it should be securely strapped down to prevent chafing of top material . Also, boot should be installed to keep top clean and dry. Wiring for power-operated top, side windows and front seat is protected by a 30 ampere circuit breaker having automatic reset. CARE OF CONVERTIBLE MODEL TOPS – The ONLY METHOD RECOMMENDED for cleaning convertible top material is the use of lukewarm (not hot) water, and a mild (not caustic) soap. The top should be cleaned carefully from end to end using a medium stiff brush or sponge. Do not saturate at any point. Do not fold top when wet. Frequent brushing with an ordinary upholstery brush or stiff whisk broom is helpful in preventing dust and dirt from imbedding itself in the fabric. CARE OF PLASTIC BACK WINDOW – To avoid scratches to which the back window is susceptible, use only a soft cotton cloth moistened with tepid (not hot) water and mild (not caustic) soap. Rinse with clear water and dry with a slightly moistened soft, clean cloth. NO OTHER CLEANING METHOD IS RECOMMENDED. Each panel is equipped with an operating button which is pushed down to lower the window, and pushed up to raise the window. Adjust front seat forward and open each rear door before folding rear seat cushion and back. This will prevent scuffing the seat back. There are two numbers which identify your car. They are recorded by the License Bureau of the state in which your car is licensed. The serial number is located on a plate affixed to the left front pillar post below the belt molding line and is visible by opening the left front door. The engine number is located on the outside of the left bank of cylinders on an extension of the lop face of the block, halfway back. The 264 engines are further identified by a cast groove approximately 1/4″ wide on the side of the extension which was provided for stamping the serial number. CAUTION-Electric storage batteries give off highly inflammable hydrogen gas when charging and continue to do so for some time after receiving a steady charge. Under no condition should an electric spark or an open Rome be allowed near the battery, particularly in the vicinity of the vent caps. Before doing any work around a battery a metallic contact between the car bumper and the ground should be made to remove the possibility of a static charge causing a spark in the vicinity of the battery. A long metal bar or a metal chain of sufficient Iength will accomplish this. Batteries in all series are 12-volt and are protected against accidentally laying metal objects on terminals. temperature remains normal. Never check level untiI the engine has been stopped for several minutes. When checking level, always remove cap slowly to be sure the engine has cooled enough to remove the pressure even at normal temperatures. The system should be drained twice a year. It is important that a rust preventive be added when refilling. Proper coolant level is stamped on the radiator tank as shown-DO NOT FILL ABOVE THIS LINE. CAUTION-When installing anti-freeze, do not use solutions that contain salt, oils, kerosene, sugar, glucose or honey. There should be 3/4 of an inch to 1 inch “lash ” or free movement in the clutch pedal at all times. Unless some “lash” is maintained the clutch may slip, necessitating replacement of clutch parts due to excessive heat and wear. The new type chrome on your car will retain its beauty and brightness providing special precautions are taken in its care. In cleaning, use only clean water frequently. DO NOT USE SCOURING POWDERS OR CLEANING COMPOUNDS. 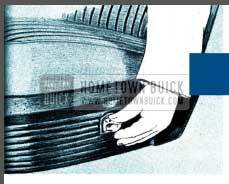 After cleaning, apply Buick Chrome Preservative at approximately four-week intervals. It is available from your Buick Dealer and provides excellent protection against dampness, chlorides, and corrosion. 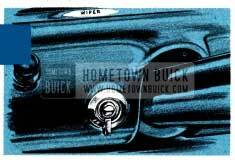 The Buick speedometer on the 50-70 series only, is equipped with a reset knob so that the trip mileage dial can be set to zero at the start of a trip. To reset to zero, merely push in knob and turn in clockwise direction until all digits read zero. To adjust forward, push in knob and turn in counterclockwise direction. This resets reading forward by tenths of a mile. LOCATION BULB NO. CANDLE POWER MAX. AMPS. The rear door locks on four door sedans are designed and are set so that the inside handles “free-wheel” when the locking button is pushed down into lock position. This prevents children from accidentally opening the rear doors. 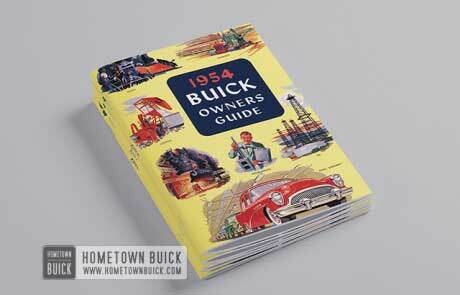 The feature can be changed by any Buick Dealer if it is not desired. When lock is set for free-wheeling it is necessary to raise the lock button before either the inside or outside handles will open the door. In fuse block mounted on lower Range of instrument panel at left of steering column. Cigar lighter-Rear Dome lamp fuse In back of lighter socket and fuse block. Power Brake Booster Motor 14 Amp. SFE Line connector near fuse block. Electric Antenna 14 Amp. SFE Line connector near fuse block. *THERMAL RELAY-There are no fuses in the headlamp, tail lamp, parking lamp or instrument lamp circuits. Protection for these circuits is through a thermostatically controlled current limit relay attached to light switch. When the current load is too heavy, due to a short circuit, the relay opens and closes rapidly thus reducing current sufficiently to protect the wiring from damage. This action continues until the cause is eliminated. 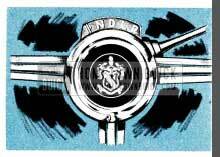 Engine – For instructions on maintaining proper oil level see page 4. The crankcase should be completely drained and refilled with new Service M.S. oil of the proper viscosity (SAE grade as shown on table below) at the end of the First 1,000 miles and every 2,000 to 3,000 miles thereafter. Certain types of operation, however, such as short run low speed operation in cold weather or in Metropolitan areas where the car isn’t driven more than 10 or 20 miles a day call for more frequent changing. Also, it is desirable to change the oil more often if the car is operated in extremely dusty territories or driven most of the time on gravel roads. 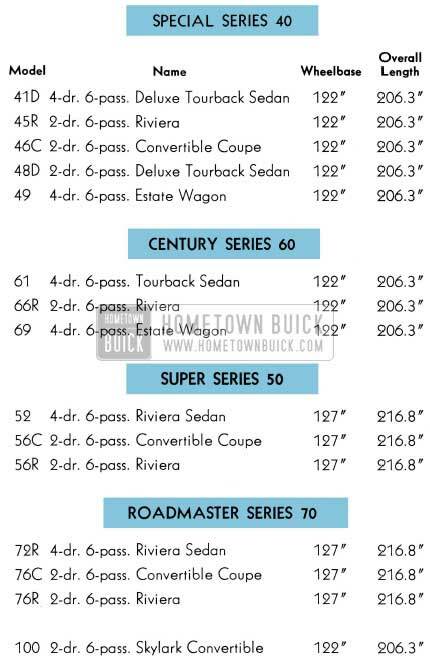 If there is any question about the change interval best suited for your type of driving please consult your Buick Dealer. The oil filter element should be changed at the end of the first 1,000 miles. NOTE: The use of SAE 5-W oils are recommended during low temperature periods because of their easy starting and quick flow characteristics. SAE 5-W oils marked for “Service MS” or “Service MM” may be used during warm days occurring in the winter season. Chassis – Wipe dirt from lubrication Fittings, then apply a good grade of water-resistant chassis lubricant, under pressure, at the following points: (1) Lower Control Arms, inner and outer ends, (2) Upper Control Arms, (3) Steering Knuckles, (4) Tie Rods and Intermediate Rod, Steering linkage idler arm bushing,(5) Brake and Clutch Pedal Shaft, (6) Clutch Release Equalizer, (7) Brake Pedal (lower end at push rod clevis), (8) Clutch and Brake Linkage may be lubricated with engine oil. 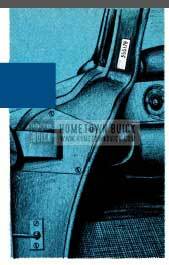 Synchromesh Transmission and Rear Axle – Check level at filler plug. Maintain level using SAE 90 Multi-Purpose Gear Lubricant (U. S. Army Spec. 2-105B) for temperatures not lower than 10°F below zero. In temperatures continuously below – 10°F, use SAE 80. Seasonal or periodic draining and flushing is not required. When complete refilling is required, however, use above lubricant in transmission but use only Factory Hypoid Lubricant in rear axle. Steering Gear – Check level at filler plug. Maintain level using Multi-Purpose Gear Lubricant as recommended for rear axle. Do not use pressure when filling. Seasonal or periodic change of lubricant is unnecessary. With power gears, turn wheels to full left turn before filling. Cranking Motor (Starter) – Apply a few drops of engine oil to the link pins and fulcrum stud of shift yoke. Battery – Add distilled water to bring level to ledge at bottom of slot in well. WARNING: DO NOT FILL ABOVE LEDGE. Radiator – Check coolant level only when radiator is cold. Maintain level at line on tank marked, “Filling Level-Cold,” using water. Filling above level line or when radiator is hot will cause loss of coolant. CAUTION: Do not remove cap when radiator is hot because coolant will boil and overflow when pressure is re­ leased. When refilling cooling system after draining, “Heat Control” lever must be moved to high position. See Page 4. NOTE: If cooling system is being drained for storage where freezing is likely to occur, it is necessary to disconnect heater and defroster hoses to thoroughly drain them. If car is Dynaflow equipped, disconnect lower hose at transmission oil cooler. Manifold Valve Shaft – Place a few drops of graphited kerosene on shaft at each end and rotate shaft to work lubricant into bearings. 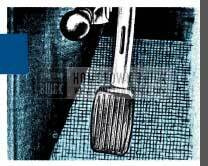 If shaft is frozen, free up by tapping ends of shaft lightly with hammer. Throttle Control Linkage – Place a few drops of engine oil at connections. Work Lubriplate into Equalizer Shaft bearings and wipe off surplus lubricant. Generator – Place a few drops of engine oil in cups at both ends of generator. Avoid excessive oiling which may affect brushes and windings. Do not lubricate while generator is in operation. Master Brake Cylinder – Thoroughly clean filler cap nut before removal to avoid getting dirt into reservoir. Add fluid as required to bring level to 1/2″ to 1″ below top of filler opening. Use G.M. or Delco Super No. 11 Hydraulic Brake Fluid. NEVER USE RECLAIMED FLUID OR ANY MINERAL OIL. 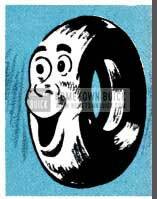 Tires – inflate all tires to pressures given on page 15. WARNING: It is not possible to in Rate tires correctly when they are hot. Hood Fastener Mechanism – Lightly coat latch lever and pilot with Lubriplate. Door Locks and Strikers – Use only SAE 10 engine oil at following points (1) Between roller and bolt (2) Edges of bolt slot in door (3) Bottom surfaces of upper and lower guide channels in striker (4) Lower surface of wedge plate bumper. Apply light film and wipe off surplus oil. Apply solution type graphite lubricant where bumper bears against striker plate. Door Checks and Hinges – On Series 40-60, 50-70, apply Lubriplate or chassis lubricant to hold-open springs in front door hinges. Use same lubricant sparingly on lugs of all rear door check links. On Series 50-70 apply light engine oil to check link pins on rear doors. No lubricant required on hinge pins. Dome Lamp Door Switches – Apply G. M. Door-Ease Lubricant to end of switch plunger and point of contact on door hinge pillar. Glove Box Door – Apply a few drops of light engine oil to glove box door hinges-wipe off surplus oil. Sparingly coat lock striker with G. M. Door-Ease Lubricant. Windshield Wiper Cables – Wipe a few drops of light engine oil on cables where they pass over tensioner pulleys. CAUTION: WINDSHIELD WIPER BLADES MUST NOT BE ROTATED BY HAND FOR ANY REASON AS THIS PLACES AN UNDUE STRAIN ON CABLE FASTENINGS. 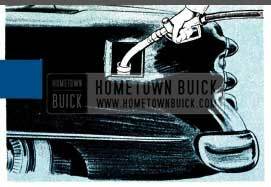 Gas Tank Filler Door – Apply a few drops of light engine or penetrating oil on the hinge pins. Wipe off excess to prevent accumulation of fine dust and dirt. Rear Compartment Lid Lock – Lightly coat lock latch and lock striker with Lubriplate. Lock Cylinders – If key operates roughly in lock cylinder, blow powdered graphite into key slot. DO NOT USE OIL. Lights – Check all lights and aiming of headlamps. Distributor – Remove distributor cap and rotor. Apply a few drops of light engine oil to felt wick in top of cam. Put 1 drop of oil on breaker arm pivot. Work a small amount of M-1172 ball bearing grease into a cloth, then hold cloth on distributor cam while engine is being cranked. CAUTION: AN EXCESSIVE AMOUNT OF GREASE WILL THROW OFF WHEN HOT AND INSULATE THE CONTACT POINTS, CAUSING IGNITION FAILURE. Power Steering Gear – All models use a pump having an integral reservoir. To check oil level, remove cover from top of reservoir and see if oil comes to specified level. Add oil specified for Dyne­ Flow Drive to maintain level. 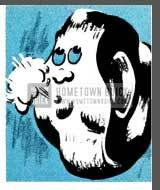 Air Cleaner – Every 5000 miles (more often under dusty operating conditions) disassemble air cleaner and wash cleaner element and oil sump with a non-inflammable solvent (kerosene is not recommended). Wipe sump dry and allow cleaner element to drain until dry. DO NOT USE AIR BLAST ON CLEANER ELEMENT. Fill sump to indicated level with one pint SAE 50 engine oil and assemble air cleaner. DO NOT OIL THE CLEANER ELEMENT BECAUSE OIL WILL DRAIN BACK INTO THE SUMP AND CAUSE SUMP TO BE OVERFULL. Oil Filter – Change oil filter element at First 1000 miles, then 5000 miles and each 5000 miles thereafter. * Remove old element, and wipe container out thoroughly with CLEAN cloths. Install new element and new cover gasket. Use only Buick Oil Filter Replacement Element Part No. 5572128 (AC PF-122), or equivalent. *In extremely dusty areas, more frequent change may be desirable. Pump Operating Countershaft – Carter Carburetor Only-Remove the two dust cover attaching screws and apply several drops of engine oil in screw holes above countershaft. Install screws. Horn Cable Connector – Pull out plunger and apply a small amount of Lubriplate. Work plunger in and out. Front Wheel Bearings – Wipe old grease out of hub and wash bearings. Work approximately one tablespoon of wheel bearing lubricant into each ball bearing. The oil seal packings should be examined for wear or leaking and replaced if necessary. Bearing Adjustment – Take up spindle nut with 10″ wrench until bearings are preloaded at least 1 hex, then rotate wheel1 revolution to make sure bearings are seated. Back off spindle nut until bearings are loose. Tighten nut until all bearing looseness is just removed, then line up nut to nearest cotter hole and install cotter pin. Do not mistake loose king pin bushing, etc., for wheel bearing looseness. CAUTION: BEARING PRELOAD MUST NOT EX­ CEED 1/12 TURN OF NUT. Rear Shock Absorbers – Inspect and fill to proper level using only Delco Shock Absorber fluid. For filling instructions consuIt Authorized Buick Dealer. Front shock absorbers are direct acting and cannot be refilled. Dynaflow Transmission – At 25,000 mile intervals the oil pan and torque converter should be completely drained and re-filled with fresh oil. Transmission MUST NOT BE FLUSHED when oil is changed. Use Special Buick Oil for Dynaflow Drive or any Automatic Transmission Fluid, Type A, which has an AO-ATF identification number embossed in lid of container. Put in 3 quarts of specified oil. With engine idling in Parking, complete the refilling to bring oil level to 1%” below “FULL” mark on gauge rod. When transmission oil is warmed up, the oil level should then be at “‘FULL” mark on gauge rod. Hydro-Lectric System M-100 – Each Fall all windows should be lowered, the seat moved back and the reservoir on the power unit removed, cleaned out with Declene or alcohol and then refilled with G. M. or Delco Super No. 11 Brake Fluid. Brake fluid heavier than No. 11 should not be used in extremely cold climates as it will cause sluggish operation of the Hydro-Lectric system. CAUTION: Before installing reservoir, make certain that reservoir gasket is in good condition and properly installed. When reservoir is installed make certain that it makes full contact with gasket all around. Any leakage of dirt or water into reservoir will cause serious damage in Hydro-Lectric system. 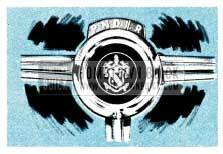 Each Spring the folding top power cylinder piston rods should be lubricated with a few drops of castor oil or brake fluid. DO NOT USE MINERAL OIL. Rear Wheel Bearings – Rear wheel bearings need not be lubricated more often than 20,000 miles. Whenever rear brakes are relined, or axle shafts are removed for other work it is advisable to inspect rear wheel bearings and oil seals. Replace seals if leaking or worn. Fill rear wheel bearings and space between oil seals with wheel bearing lubricant. Coat leather edges of seals with lubricant before installation of axle shaft. Speedometer Cable – The speedometer cable is factory lubricated with special grease and normally requires no further service unless it becomes noisy. In extremely hot climates, or where considerable dust and water is encountered it may be necessary to lubricate the cable at intervals of approximately 20,000 miles or every two years. It is advisable to have this service performed by an Authorized Buick Dealer to insure use of the special grease in proper quantity. Sunshade – If sunshade rod turns hard in support, remove retainer screw, pull rod from support and apply G. M. Door-Ease Lubricant. Do not use oil which may soil trim. Install rod in support and adjust retainer screw to proper tension. Cleaning Leather – (1) Apply a damp (not wet) cloth to mild soap and rub surface of leather briskly. (2) Wipe with moist cloth without soap. (3) Rub dry with clean, soft cloth. 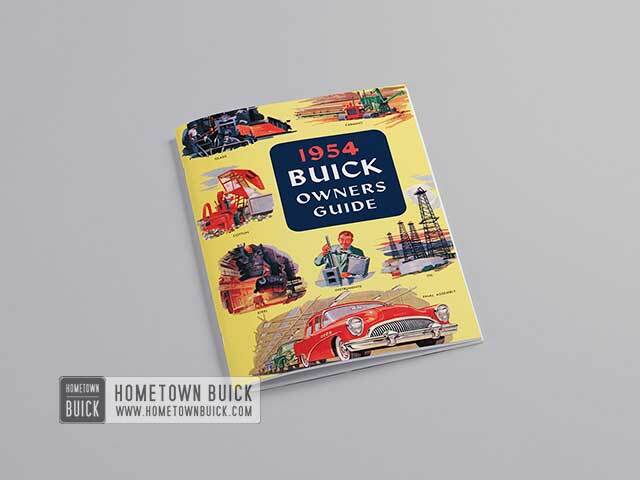 License Weight: Consult the dealer who sold the car to the original 1954 Buick Owners or the Motor Vehicle Commissioner of your State. Weights of all Buick body styles are regularly supplied to these authorities. 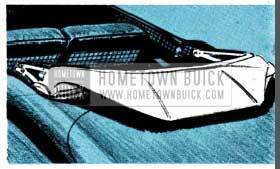 For better care of your car, look for the Buick Authorized Service sign which your dealer displays. It is your assurance that he uses only Buick Engineered Parts and that his personnel are thoroughly qualified to make repairs or adjustments to your car. 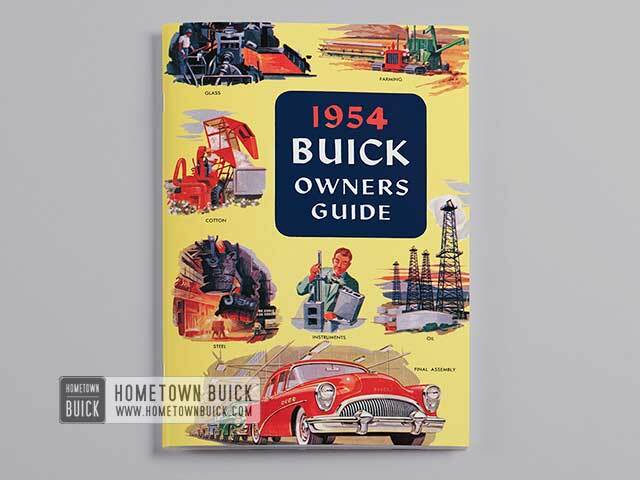 Buick Factory-Trained Mechanics are continually kept advised in matters concerning Buick automobiles through such mediums as letters, manuals, bulletins, schools, etc. 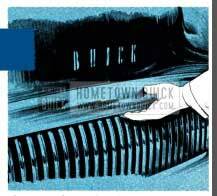 The Buick mechanic is an expert in the care and maintenance of your Buick. It is his sincere desire and he is eager to keep your car in top condition; to afford you complete satisfaction in maintaining its “new car” beauty and dependability. For long, satisfactory performance in your car, let him prove to you that BUICK CARE KEEPS BUICKS BEST. 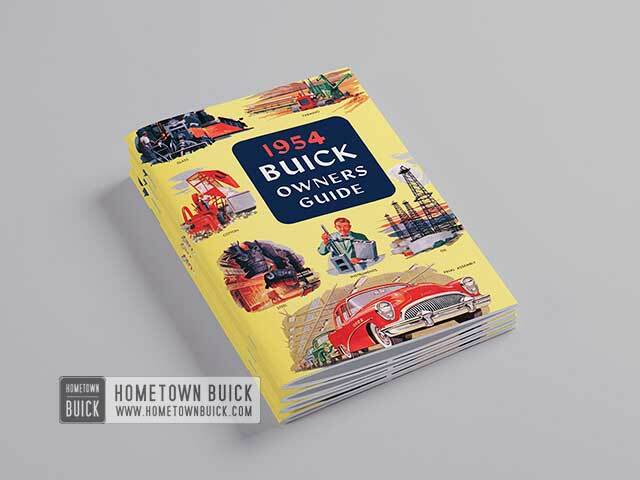 1954 Buick Owner’s Manuals were accompanied by a leaflet : In a car equipped with an ordinary automatic transmission, shifting gears is accompanied by surge-pause-surge. 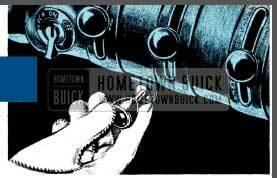 In your new Buick equipped with Dynaflow drive, there is no annoying gear change… and you are OFF IN A SILENT WOOSH!